Steel playground shelter for Wingrave Combined School. 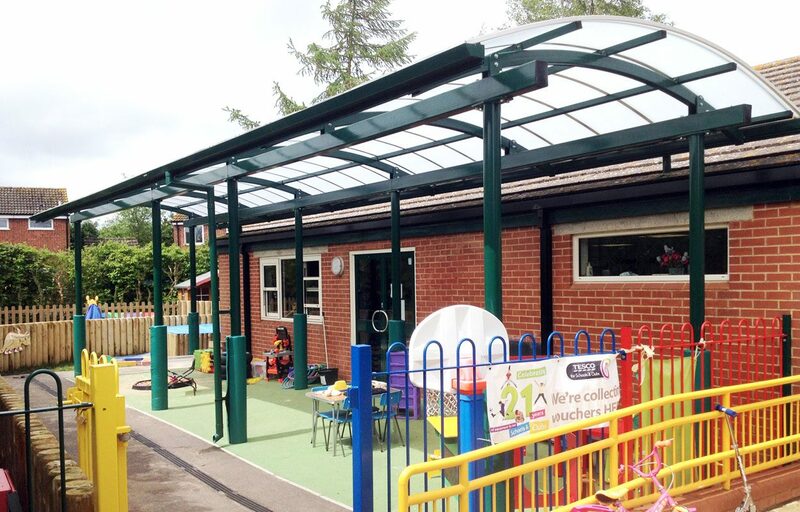 Fordingbridge designed a steel canopy for Wingrave CE Combined School, which creates a sheltered outside play area protected from rain, wind and sun. Providing a covered play space for the children, the canopy also acts as an entrance canopy to the adjacent building. The 16mm triple clip polycarbonate system used for this project creates a hard wearing roof covering. It is designed for an endless range of glazing and roofing applications, extreme weather conditions, and is known for its light transmitting (32%) and reflective qualities. We supply and install padded covers for canopy posts in play areas for children. Available in a range of colours for all post sizes, you can find the spec on our post protectors here.